I recently witnessed the creation of sacred space. It didn't happen easily. And yet it did. It took a lot of preparation. And yet it took none at all. I had everything to do with it. And I had nothing to do with it. 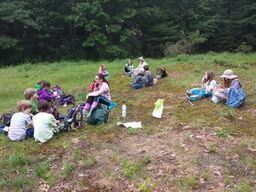 This spring, I spent many hours completing all the paperwork needed to get the One Earth Collaborative Interfaith Woodland and Wetland Summer Adventure Camp at Open Spirit in Framingham, MA licensed. It was a lot of work, but it made a difference in how I felt about the camp. I spent time planning, deciding to which conservation areas we would take the children. 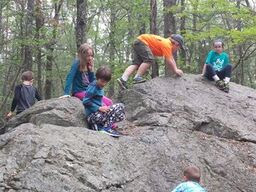 Then, the last week in June, my friend Michael and I headed out onto the trails in the conservation areas of Metrowest Boston with a small group of children ages 7-10 and one teen CIT. Each morning we explored a different area, hiking up to three miles. 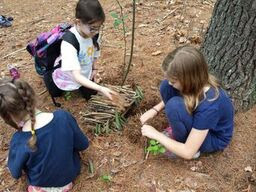 Each day, the natural world around us provided the lead as to what we did as we explored the preserved land in the Metrowest area. In addition, we had lunch outdoors, making up a blessing of gratitude each day before eating. We had quiet time, where each child sat alone in observation, meditation, or play. And at the end of each day, each camper completed a page in a journal to take home at the end of the week. On Monday, we played Pooh sticks, saw a coyote and a family of geese, learned about fresh water mussels, and so much more. 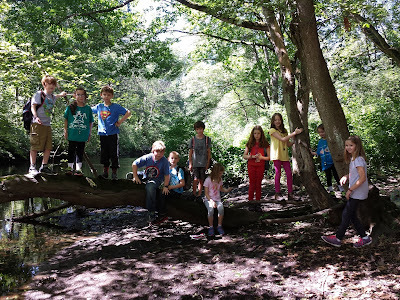 On Tuesday, we hiked an esker, stood by a river bank and listened to the birds, found our way to a hilltop meadow for a picnic, walked a boardwalk through a maple swamp, listened to frogs in a pond, and so much more. 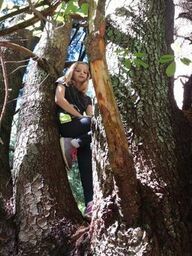 On Wednesday, we climbed trees, observed an ants' nest, a heron nest, and a spider web, found spider egg cases, crossed over many bridges, and so much more. On Thursday, we went letterboxing, hiked to a local high point where we could see all the way to Boston, climbed a giant glacial erratic, found sticks, sticks, and more sticks, and so much more. 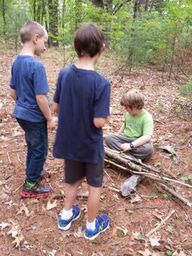 On Friday, we found mushrooms and feathers large and small, and hiked along a stream, beside a pond, and up a hill, where we discovered a stick lean-to that someone had built. Then, in that space beside the lean-to, magic happened. They bartered, they cooperated, they shared, they created, they interacted in the world of imagination. They became one with the world around them and with each other. 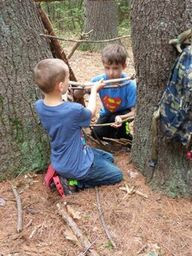 The children created sacred space and time. It took so much preparation, and no preparation. It was so difficult, and it was so simple and easy. I had everything to do with it, and nothing to do with it. Thank you to all those with the foresight to preserve local conservation areas. Thank you to the campers of the 2017 Interfaith Woodland and Wetland Adventure Camp. * I may have gotten some details wrong, and if so, my apologies to the campers, and I'll be happy to make changes if corrected.